A few sites have started previewing the upcoming 8.9″ Asus Eee PC T91, Asus’ first touchscreen and Tablet PC convertible netbook/ultraportable. Last week, Mobile Computer was able to make a hands-on video of a pre-production model of the Eee PC T91. They show off the build-quality. The model they had came with a built-in Digital TV tuner and GPS, although that will probably be optional at the retail level. They do show the rotation of the display and converting it back and forth between a Tablet PC and a laptop. It works with both finger and stylus. There is a button that appears to allow for converting between landscape and portrait modes. They discuss the built-in battery (that is not replaceable by the end user). Their model came with a 16GB SSD. The RAM is accessible by the end-user (so that you can probably go up to 2GB versus the default 1GB). They even compared it size-wise with the 10″ Eee PC 1000HE and mention that the T91 will come with the chiclet-style (or scrabble-style) keyboard that comes with the 1000HE as opposed to the keyboard shown on the pre-production model. NetbookNews.de’s Sascha was also able to put together a high-quality video, and it showcased the T91’s touch interface. He called it a “netvertible”, a play on netbook and convertible. Asus has developed a custom touch interface running on top of Windows XP Home. There is a scrolling sort of wheel with icons/shortcuts. There is a sort of a bar in the middle that you can use as a bookmark bar for applications you frequently use – it’s called a “quick launch”. The “FotoFun” software was interesting – it makes use of the touch interface. Mobile Computer mentions that a 3G version will be sold through mobile carriers, but that none have been named. Sascha at NetbookNews.de mentions a price of $500 – not sure if that’s US dollars, and that it will be out in the second quarter of 2009. Next week’s CeBIT 2009 should see the release of a lot more informationon the T91 (as well as the 10-inch version, the T101). Back in April of 2008, there were several stories about Seagate Technology LLC filing a lawsuit against STEC inc., alleging various patent infringements covering Solid State Drive (SSD or Solid State Disk) technology. In a statement, Scotts Valley, Calif.-based Seagate said pursuing the case is no longer worth the cost because poor economic conditions have limited Stec’s sales of the disputed technology. But Stec, based in Santa Ana, Calif., called Seagate’s patent claims “unsubstantiated,” and said after the legal discovery process, in which companies exchange information, Seagate dropped its claims. Intel has expanded its Consumer Ultra Low Voltage (CULV) Platform into three distinct tiers, and it’s also added two new Ultra Low Voltage (ULV) CPUs, which should be available in March of this year. These ULV CPUs and the CULV platform are designed for ultra-thin or ultraportable laptops/notebooks, and are not going to be found in netbooks. 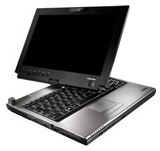 They are more for conventional laptops such as the 12.1″ Toshiba Portege A650. The SU9600 has been mentioned as a candidate to replace the 1.4GHz SU9400 in the past. According to recent reports, Intel sees the CULV as a crucial part of its strategy when it comes to defining the various segments of the laptop market, and the previously mentioned ULV CPUs play into that, as does Intel’s GS45 chipset. Toshiba has introduced three new models in its 12.1-inch Toshiba Portege M750 line. The M750 laptops are “convertibles” the display rotates/swivels around to allow you to convert back and forth between a normal laptop/notebook form factor, and a Tablet PC setup. These three models are new in the United States. If you want to jump up to an actual touchscreen as opposed to using a Digital Pen, it’ll cost you around $400 USD, although you get a bump in the CPU performance as well as an optical DVD writer. LAPTOP Magazine has updated their 10-inch netbook face-off with a couple of new models, as well as well as updated models of previous netbooks they have reviewed. In the original face-off, the MSI Wind U110/U100 and the Samsung NC10 came out on top when it came to battery life tests. This time around, the HP Mini 1000 and Samsung NC10 came out on top with keyboards (no surprise, the NC10 is The Netbook when it comes to the keyboard). A major focus of the Eee PC 1000HE was battery life – that’s the main selling point in addition to the chiclet-style keyboard, and it came out on top in the tests. The 1000HE and the 10-inch Acer Aspire One came out on top as far as value.